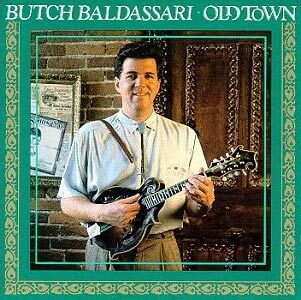 Butch Baldassari's mandolin playing on his Old Town album floats like a butterfly and stings like Monroe. I was digging through CDs stacked in my bedroom the other night and looking for something good to listen to, something I wasn't burnt out on. Up came Old Town, and yeah, I thought, this is sweet. But you forget just how sweet, until those first notes of the title track "Old Town" burst out of Baldassari's mandolin. Then in comes Stuart Duncan sawing off smooth fiddle licks and Tom Adams driving nails with his banjo, backed by Tim Stafford on guitar and Mike Bub on bass. Why does this matter, since Old Town is not a new album on the scene? It matters because the quality of playing and arrangements on this CD are timeless. And we all lose time. We turn around and the kids are grown, they don't make our favorite canvas tennis shoes in the United States anymore and FM public radio stations now operate like elite and aloof corporations. So it's nice to have something timeless. Music can do that, when it's sincere and superb. And time surprised me regarding Old Town. I would have guessed this recording to have come out somewhere between 1999 and 2002. Maybe because that's about the time I finally got a copy. But no, I opened up the liner notes and it said "1990 Rebel Records." Almost two decades have passed. My ignorance is also fueled by the fact that I don't know Baldassari personally. I've never met him. I'm aware that many readers here on the Mandolin Cafe know him well and have followed closely the thread regarding his recent medical challenges. But all I hold regarding awareness of him is a CD cover photo of a nattily dressed guy with a slightly mischievous smile holding a fine-looking Gibson F5 mandolin, and songs coming out of the speakers that give me a far higher plane to aim for as a mandolin player. Old Town is, in my opinion, one of the finest bluegrass mandolin showcases ever recorded. There are no vocals, the instruments do all the talking, and they say a lot. The mandolin is featured and not just a supporting player. Yet it doesn't always kick songs off and end them. Sometimes it comes in for solos during the middle of a song, in a moment where the musical tension between melody and chords is ripe for statement. When it's time to solo, Baldassari's tone is remarkable. It's pure and woody with chime, clean and vibrant. He can play the little notes and the big notes, play them fast or slow with the perfect interval between them no matter the speed. In rhythm, his chop is perfection. It's always an addition, never a distraction. Baldassari's own composition, "Old Town," starts the album with bouncy bends and twists. The next, "Boscoe's Boogie," is pure Monroe style but with playfulness. This whole album pays homage to Bill Monroe, especially with tunes such as "Honky Tonk Swing" and "Kentucky Mandolin" included. There's no denying how we all feel about the master's soulful playing. But Baldassari plays these tunes with such a clean, full-note touch, without losing the human feeling behind them, that he takes Monroe style to a new level. It just occurred to me that Monroe was still alive when this recording was made. He must have approved of the twin fiddle playing of Allison Krause and Andrea Zonn on Track 3, "Black Canyon," the bluesy and moody minor key song written by Krause. Just think, in 1990 Krause had yet to win a bazillion Grammy awards and record with one of the Gods of Rock Music. She was just a young bluegrass fiddle player with a sweet voice and a few albums to sell at the festival tables. A host of great players appear on this CD, including headline talents such as Sam Bush and Alan O'Bryant. The Nashville Bluegrass Band and Union Station ensembles provide much of the backing and they're tight. They're in their prime, they've been playing a lot together, and they can carry each other to those magical places where one creative note begets another. Something else makes Old Town flow smoothly. Baldassari and company don't burn everything. The pace is never forced. Each song is allowed to breath, you can hear all the notes easily, whether you focus on the lead player or the rhythm players. That's what sets this recording apart from so many before and after. You can savor this music, understand and absorb it. I'm not familiar with the bulk of the music Baldassari has recorded so far in his career. Classical ensembles, jazz and so forth. He's one of those people capable of doing it all and he's put it on record, and I haven't caught up with it all yet. But I still haven't gotten over Old Town, his second solo recording. Krause said in the liner notes she wrote for the album: "Butch is certainly one of my favorite mandolin players, and if you're a fan of the right notes and beautiful tone, I'm sure he'll be one of your favorites too!" That may be true of Baldassari. But I think the musicianship on Old Town, created in part by when the musical careers of these players happened to come together in the studio to make it, elevate this recording itself to a permanent place for those who love the mandolin and its acoustic cousins. I always seem to want the final cut on the album, Baldassari's composition "Waltz For Bill Monroe," to not end. In the big picture it won't. The music on Old Town is going to be rediscovered and embraced by generations of mandolin players, over and over again.